So what is it? It’s the processor graphic for the latest Intel server processor – E7xxx – which comes out next week. 10 cores, and it will go in the four-socket boxes (DL580 and 980 in HP parlance). This means that it delivers 40 cores in a box- plus hyperthreading. So 80 threads in a single box. Not only that, but it will support 2 Tb of memory – importantly with no speed drop. There’s also be built-in encryption with next to no overhead. 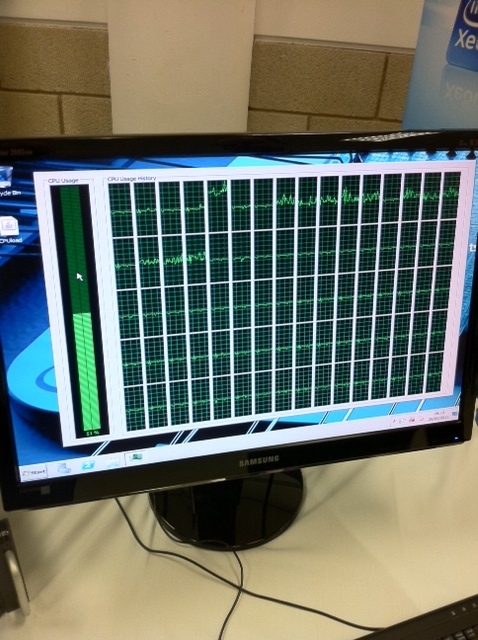 Think about it- VDI, OLTP, gaming, heavy virtualisation, finance where the database needs encrypting… Impressive stuff. This entry was posted on March 29, 2011 at 1:07 pm and is filed under Cloud, Converged Infrastructure, Virtualisation. You can follow any responses to this entry through the RSS 2.0 feed. You can leave a response, or trackback from your own site. Awesome stuff, specially on really heavy virtualisation!! Wonder how much one of these bad boys are on a DL580! I don’t know how much it will be; I would imagine we will know more after the official launch on Monday. Not cheap I would have thought, but you are right – for pervasive, heavy-duty virtualisation loads it could be fantastic!